A DJ booth is just one amenity packed into this modern surf shack. 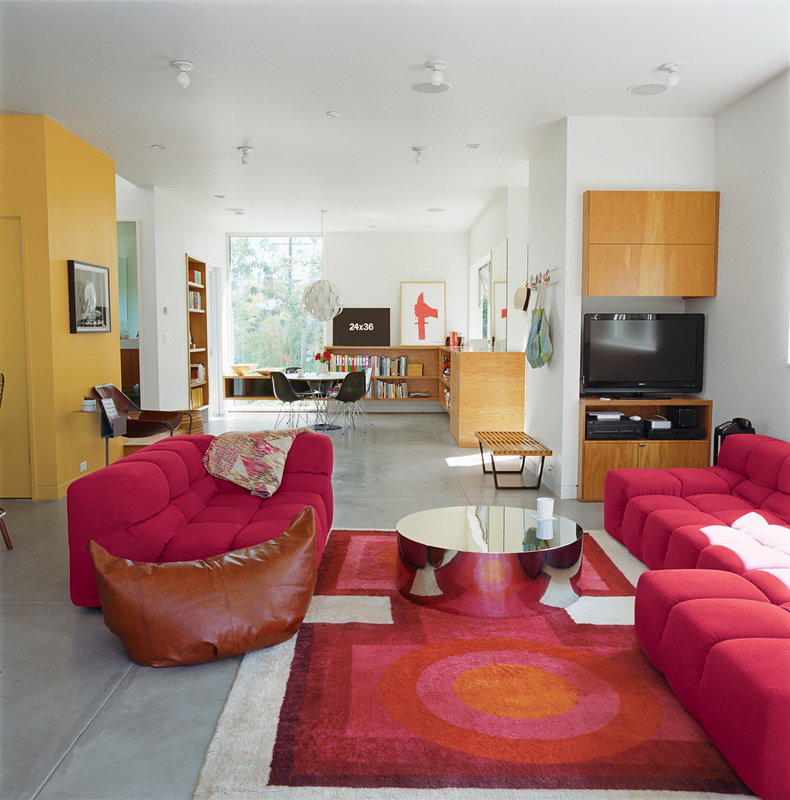 Grunbaum was unafraid of a little color, as his living room proves. It includes a coffee table by Mockett and a Tufty-Time sofa by Patricia Urquiola for B&B Italia. A music and cycling fan (the vintage bike is by Vivalo), Grunbaum mans the turntables while friends gather in the kitchen. Case Study barstools are from Modernica. The dining room is meant to be a flexible space for eating or dancing. “One of the most important things for me,” explains Grunbaum, “is how a house feels. It has to be a place where you don’t want to leave.” The Cyclone table is by Isamu Noguchi for Knoll and the pendant lamp is by Lightoiler. Bestor restricted the height of the walls on the second floor to allow the clerestory windows to carry light from the front deck all the way to the guest bedroom in back. The “murdered kitchen” includes a fluorescent light sculpture with dimmable ballasts designed by Bestor. The rough plywood offers a nice chromatic contrast. 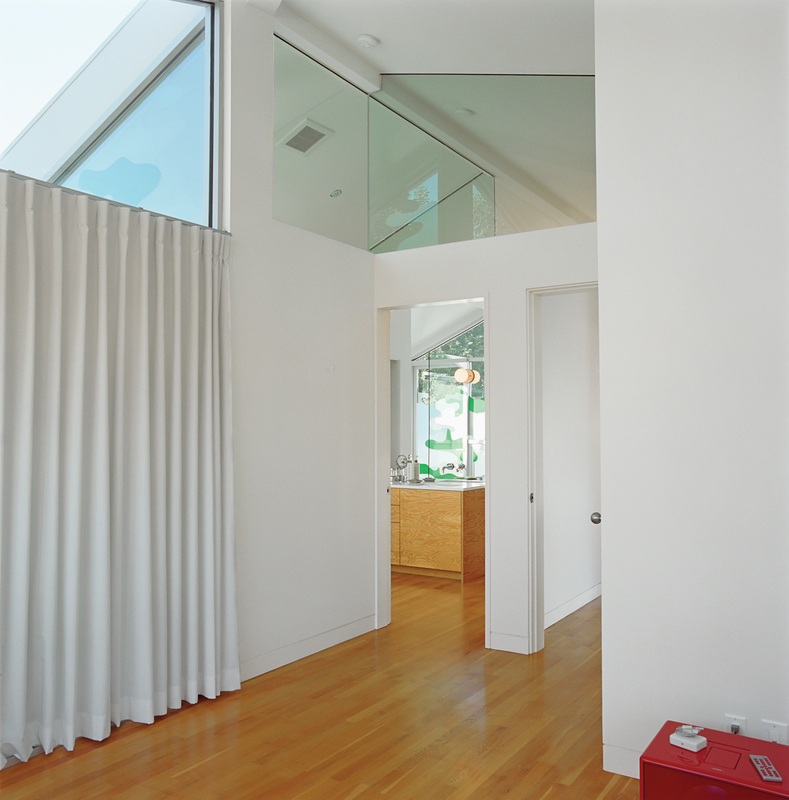 Bestor gave each area of the house its own color scheme. The bright yellow stairwell maintains a cheery mood throughout. Magenta is one of Grunbaum’s favorite colors, so he picked out a magenta Tufty-Time couch by B&B Italia and added a hot pink powder-coated faucet by Vola for the downstairs bath. California isn't known for its front porch culture, but Grunbaum loves Venice's walk streets and their pedestrian vibe, so he employed landscape designer Stephanie Bartron to orient his small patio towards the street. The house itself acts as a windbreak, and lush patio furniture and a small fire pit turn what could have been another exercise in backyard solipsism into the home's most neighborly spot. I grew up on a 40-acre farm about 15 miles outside of Portland, Oregon, so I’ve always felt at home around nature. That may be why I was attracted to the walk streets in Venice, where sidewalks and gardens—–not thoroughfares and traffic—–run between the neighborhood’s front yards. We’re all a bit close together, but you don’t see any cars and the whole scene is much more intimate and neighborly. From an early age, architecture has been one of my loves. My parents built the home I grew up in with Oregon mid-century modernist Van Evera Bailey, and I hoped to someday build a house of my own, thinking I would maybe justify such an undertaking when I was “all grown up” with my own family. But when the project began, I was still a single guy—–and my “family” was actually an expansive group of friends—–fellow musicians, writers, designers, and other creative types. So I wanted something that would work in either case: a flexible but comfortable space that could be a home to raise children, and also a fun, casual place where people could hang out, relax, and not want to leave. That’s one reason I asked Barbara to build a DJ booth in the living area. We thought that this would become the communal center of the living area—–the hearth—–instead of a TV or a fireplace. When friends visited, I could just jump up and put on a record, or let others take turns. I could also throw a blow-out party, push the sofas out of the way, and transform my living room into a dance floor. As I was thinking about all of this, I was traveling to Japan a lot for work. Generally speaking, the Japanese work within tighter constraints and smaller footprints. And yet they still manage to create beautiful spaces that are simultaneously bold and progressive, smart and restrained. That became a central motif for us since we didn’t have a lot of space to work with. The property is 3,330 square feet, and most people tend to build to the edge to maximize indoor living space. I wanted to make sure that there was enough outdoor space to take advantage of L.A.’s climate and satisfy my outdoorsy Oregon roots. Both Barbara and I love the ori-ginal cottages that were built here in the early 1900s, so she took what looks like a typical pitched-roof bungalow, dipped it in white paint, and inserted a loftlike space underneath it. 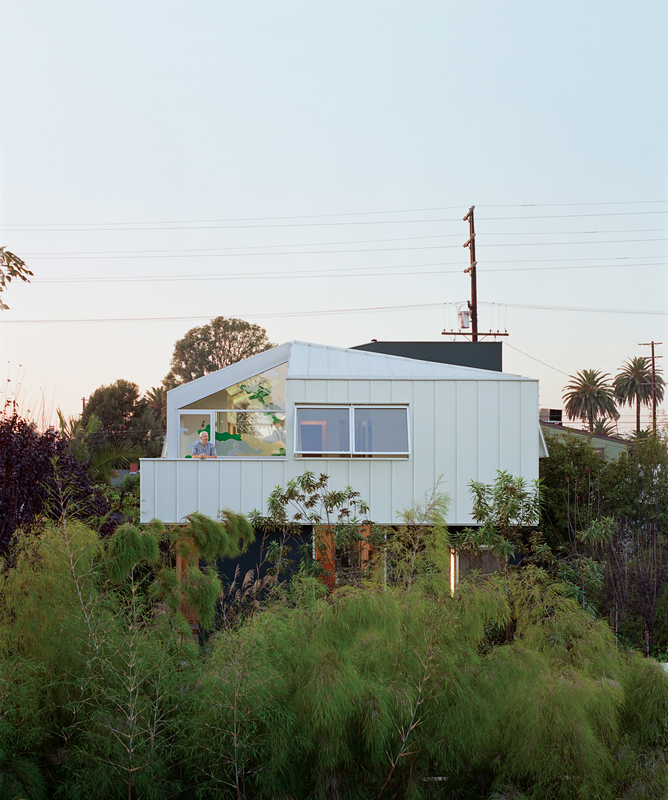 The second story became this white form hovering above the house like a cloud. it allows you to see the shapes created by the roof and the walls. Barbara has a gift for building homes that feel good to be inside and knows what a huge role color plays. She encouraged me to think about different graphic color “moments” in the home. The stairwell became bright yellow. The living room is in shades of magenta. In the kitchen, she came up with the idea of “murdering” the center island, riffing on the L.A. phenomenon where people “murder” their cars, which is to say, they remove all the trim and ornament and black everything out: the windows, wheels, light covers, trim, everything. So we clad the entire island, top to bottom, in black laminate and installed black appliances. People have told me that they really appreciate the restraint of the design on one level and the exuberance on the other, and I think that was our goal: an informal, open, flexible home that I could share with my friends. But the thing that made the biggest impression on me after moving in was the light. I love sitting at the kitchen island in the morning and looking out at the sun coming through the treetops. And that light comes from different directions throughout the day and remains constant. Even the moonlight at night comes through the bedroom’s large clerestory window. It really elevates your spirits. But for me that’s true of all great design. To see more images of the project, please visit the slideshow.